Hundreds of thousands of Palestinians are voting in elections to install a new leadership who could launch a new era of peace making with Israel. The BBC News website answers the key questions about the vote. The Palestinian presidential election is being held to appoint a successor to the late Palestinian Authority President Yasser Arafat, who died on 11 November. The poll turns over the final page of the Arafat era and fulfils the need - from an Israeli and American standpoint, articulated by President George W Bush in June 2002 - for "the Palestinian people to elect new leaders, leaders not compromised by terror". Palestinians in the occupied territories have not had the chance to vote for a leader since Arafat won by a landslide in 1996. The post of PA president was only meant to be temporary, until the interim Oslo agreements were superseded by permanent status talks bringing in a fully-fledged state of Palestine. But permanent status talks were never completed and the peace process went into reverse. Only Palestinians resident in the West Bank, Gaza Strip and East Jerusalem can vote on 9 January. About 1.1 million people have registered - about 60% of the eligible population. Palestinians with Israeli citizenship (about 1 million people) are not eligible to vote, nor are the estimated 4 million Palestinians and their descendants who live as refugees in other countries. The rationale for this is that the Palestinian Authority only has authority in the West Bank and Gaza. The interests of refugees are supposed to be represented by the Palestine Liberation Organisation. Palestinians living in East Jerusalem - which Israel has annexed and sees as its exclusive domain, while international law decrees it to be occupied territory - have their own special arrangements. They will be allowed to vote through an "absentee ballot" at five city post offices. But the majority of Jerusalem's 230,000 Palestinian residents are expected to boycott the vote. The next-strongest candidate according to opinion polls is independent Mustafa Barghouti. He is an advocate of reform and non-violence, but also has support of the Popular Front for the Liberation of Palestine, a militant group. Other party-sponsored candidates are Tayser Khalid of the Democratic Front for the Liberation of Palestine and Bassam al-Salhi of the communist-leaning Palestinian People's Party. Others running as independents are former Islamic Jihad leader Sayyed Baraka, Gaza lawyer Abdul Karim Shubayr and a man currently under house arrest in the US under suspicion of raising money for Hamas, Abdul Halim Ashqar. Several candidates dropped out during the campaign, most prominently the Fatah rival to Mr Abbas, Marwan Barghouti. Currently serving five life sentences in an Israeli jail, he is the only candidate who might have posed a challenge. But he withdrew under pressure from fellow politicians worried about the potential schism. What are the voting arrangements? More than 1,000 polling stations staffed by 17,000 officials will be open from 0700 to 1900 throughout the Israeli-occupied territories. Hundreds of international observers will monitor the process and voters will be stamped with indelible ink to prevent fraud. Israel has said it will reduce as much as possible the travel restrictions it imposes on Palestinians in the West Bank and Gaza. It will also reduce its military presence in Palestinian towns and withdraw from all cities ahead of voting. Some military checkpoints are to be removed and free movement afforded to candidates and their supporters. Will the election improve hopes for peace? Much of the international community appears to be banking on a victory for Mahmoud Abbas and for that victory to enable a new round of peace-making. He is a seasoned peace negotiator and is not suspected by Israel or the US of supporting militant attacks - the main reason Yasser Arafat was frozen out of negotiations. But questions remain about the authority he may have among Palestinians. Even if he wins by a wide margin - which seems likely - he will struggle to portray himself as a unifying figure as Arafat did. Militant groups Hamas and Islamic Jihad - which have comparable levels of support to Fatah - are boycotting the election. And while the ranks of Fatah loyalist militants have swung behind Abu Mazen the honeymoon period may not last long if his presidency does not bring tangible improvements to Palestinian life. 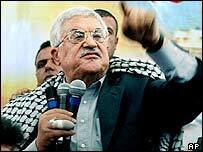 Can Abbas halt militant attacks?